The story of the older generation of women in Korea is one of endless sacrifice that borders on tragedy. While the percentage of women receiving college education has surpassed men since 2005, the post-war and pre-1990s generations in particular have suffered from extreme gender discrimination, the most common of which was receiving little to no education. Upcoming documentary films “Granny Poetry Club” and “The Poem, My Old Mother” features the story of the women in their 80s and 90s learning how to read and write for the first time in their lives. But the two films take very different approaches. “The Poem, My Old Mother” by director Lee Jong-eun, takes a solemn approach about the tragedy these women have had to live through. Particularly in rural towns, women were expected to support the households through never-ending chores and received almost no credit. Yun Geum-sun writes in her poem of how she was unable to help her son with her homework, told him to wait for his father, and hid her tears in shame. The misspelled writing on the screen and the quiet music is effective in bluntly delivering the weight of the harsh reality that she and countless others had to live through. This is also shown in the interaction with their now-grown children. A daughter of one of the women featured in the film laughs with delight, then tears up as she sees her mother’s poem, complete with adorably childish drawings. “I cannot help but feel sad. I know how she (my mother) lived her life,” she says. Now, I have nothing but utmost respect for these brave and admirable women and their unconquerable will that was the backbone of Korean society that stands today. For all the political bigwigs and chaebol conglomerates, it was their selfless sacrifice that was the drive behind the rapid economic growth of the country. Having said that -- and running the risk of sounding heartless and cold-blooded -- the film soon becomes boring. Its structure is far too repetitive, with touching stories merely juxtaposed and similar wistful music playing every single time the audience members are supposed to feel moved. I know that in films like this the story is all that matters, because it is strong and authentic as can be, but this is just lazy directing. It is possible to make a story authentic, moving and fun to watch at the same time. A case in point is the second film dealing with the same subject matter. “Granny Poetry Club” is not only a tribute to an admirable generation, but is fun to watch. Keep in mind, a lot of the film’s appeal lies on the hilarity of the dialogue and the women’s Gyeongsang dialect, so it would be more enjoyable to someone who actually understands Korean. The film also stars multiple old ladies, but they interact with each other and with their much younger teacher, with all of them vivacious and likeable. It is this chemistry that makes it fun to watch; these are all very funny and adorable “grannies” and I genuinely care about them. Sometimes a story is so strong and heavy that directors have to control themselves and let the power of the story overwhelm the viewers, like when dealing with comfort women. Portraying their horrendous suffering is more than enough to handle. But while the old ladies in “The Poem” have sacrificed nearly their entire lives for their families, they are more than just victims. They are people, and their lives are going on right now. Kim Jae-hwan’s “Granny Poetry Club” focuses on those lives, and the women’s interaction with each other, their daily quarrels, daily chores, licking stamps in a post office, the conversation about death -- in a casual way that is possible only by those so close to it -- are all very authentic and interesting. The viewers are more invested because we end up caring about these people. While many of the poems in “The Poem” talks most of pain and sacrifice, the poems here are lighthearted and funny. There were two quite emotional moments that stand out in the documentary. One was when Gang geum-yeon for the first time in her life wrote a letter to her son, and upon receiving his reply, reads it out loud. Understandably, the old woman tears up, but the camera pans away from her face and onto the letter. This was a pretty smart move from the director. The second one came off as a bit of a surprise. 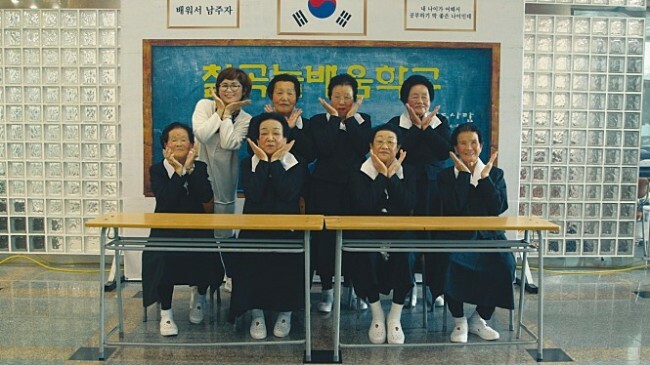 It was when the grannies dressed up in school uniforms and entered a singing and dancing contest, hosted for senior citizens like themselves who are learning Hangeul late in their lives. Not one tear was shed and the scene was very lively, but the way the women chattered playfully like actual 16-year-olds made me emotional. Perhaps it was the sight of them enjoying the high school years and the youth that they never really had. They never wore school uniforms, never went to school, and never got to be playful 16-year-olds chattering about their handsome young teacher. The film did not need to hammer home the message. It was shouted loud and clear through the lives shown on-screen and off-screen as well. That is the power of directing. Both documentaries deal with a very meaningful subject matter, but while “The Poem” is a story of endurance, “Granny Poetry Club” is one of life. “The Poem, My Old Mother” opens at local theaters on Feb. 5, and “Granny Poetry Club” opens on Feb. 27.